Our New London, CT funeral home has been serving the community of Southeastern Connecticut since 1950. It was founded by the late Anthony J. Impellitteri on the principles of impeccable service, compassion and understanding. 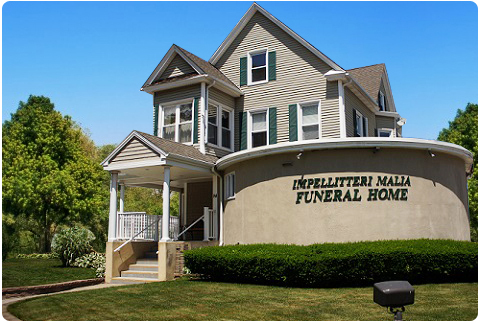 The funeral home today is under the direction of John B. Malia. John carries on the tradition of complete personalized service and is well known to the community. Our traditional home in design was renovated in 2008. The facility is tastefully decorated in soft pinks, mauves, shades of gray with floral patterns. This homelike facility creates a warm and welcoming atmosphere to the families we serve. At the most difficult times, you can depend on our professionalism and years of experience to assist you and your family. In today society, when individuals attitudes require a variety of funeral service alternatives, you will find us to meet your funeral planning needs. We believe that a funeral should be a meaningful experience. We are here to listen, offer suggestions and carry out your wishes.